Last summer and this summer, my boyfriend and I made a journey to Provincetown, to visit his family. Among P-Town’s many charms–long stretches of beach, restaurants and shops aplenty, a cluster of fantastic coffee shops, bustling nightlife–is 141 Market on Bradford Street, a small but richly stocked market that features organic produce, foods prepared by local artisans, and a huge array of fresh, in-house made salads, soups, and hot bar items. Steven and I love stopping by for casual lunches; the food is reliably delicious. 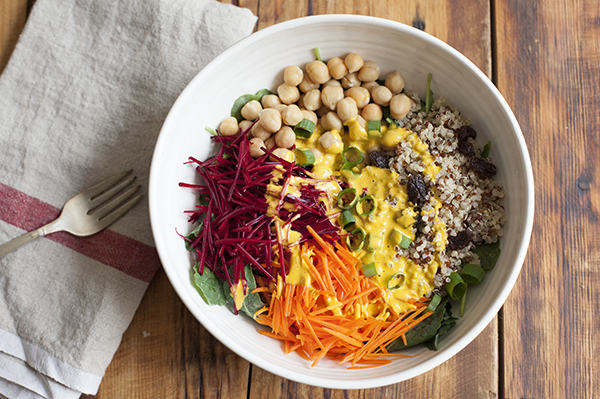 A few weeks ago, I picked up a beet, carrot and kale salad at 141 that featured a creamy cashew carrot dressing. 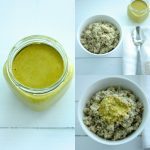 I’m pretty fanatical about dressings, and I tend to have high standards, so it’s no small matter to say that I couldn’t stop raving about how tasty this dressing was. When Steven tried it, he was equally impressed, and we said that I’d have to try my hand at recreating it at home. While the dressing I’m sharing today isn’t an exact replica of the 141 concoction, it’s similar. At the least, it captures that dressing’s creamy texture and wonderfully sweet/salty flavor. Sweet and salty tends to be my salad dressing default, so forgive me if this recipe feels overly familiar. But it’s really wonderful, and I hope I can entice you to give it a try. 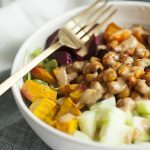 Beneath every great salad dressing is a great salad, of course, and so I wanted to share a new salad bowl recipe along with the carrot cashew mixture that inspired this post. I settled on a nutrient dense combination of cooked quinoa and chickpeas, baby kale, carrots, beets, raisins, and green onions. 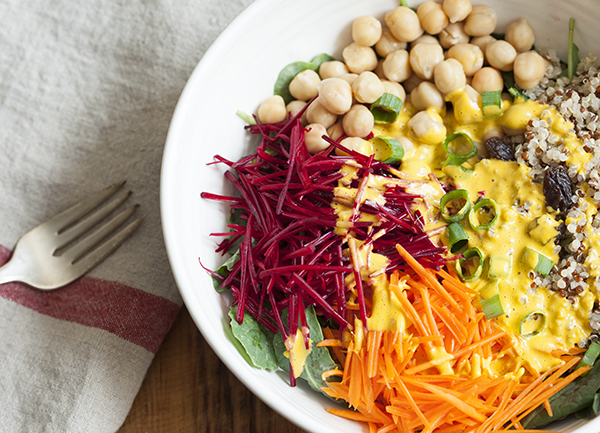 It’s colorful, full of texture, and satisfying–everything I love for a salad to be! 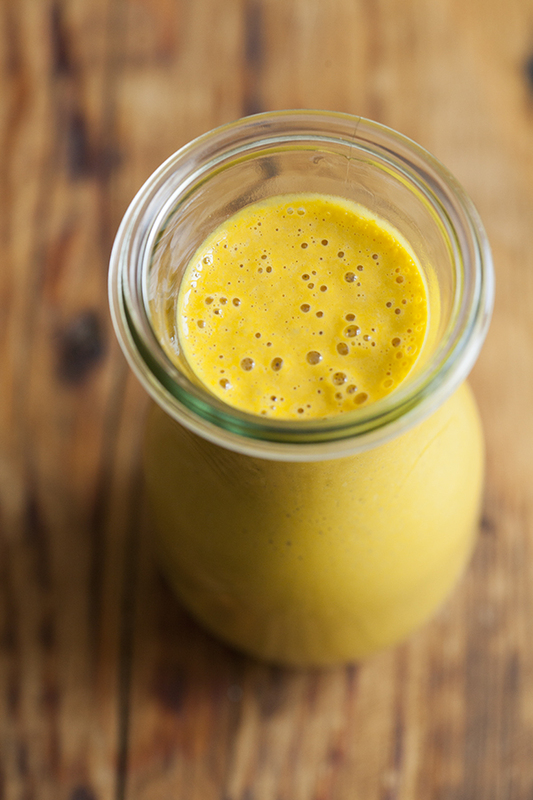 To prepare the dressing, put all ingredients into a powerful blender and blend until smooth. Dressing will make about 1½ cups. 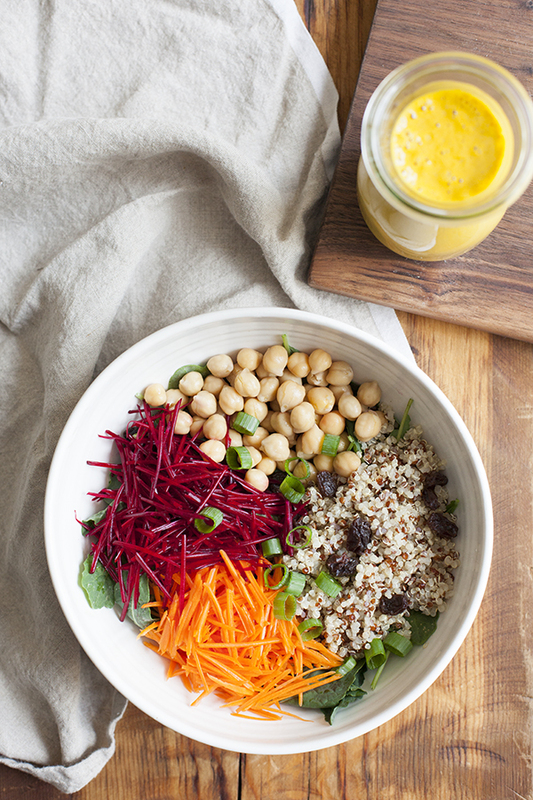 To prepare the salad, divide all ingredients into two bowls. Drizzle with dressing (about 3 tablespoons each). Serve. Dressing will keep in an airtight container in the fridge for up to four days. Of course, this bowl is only a suggestion. The carrot cashew dressing will work wonderfully as a dip or a dressing for any salad that you love. You’ll taste the ginger, but the amount I used was relatively moderate, so that other flavors could shine through. 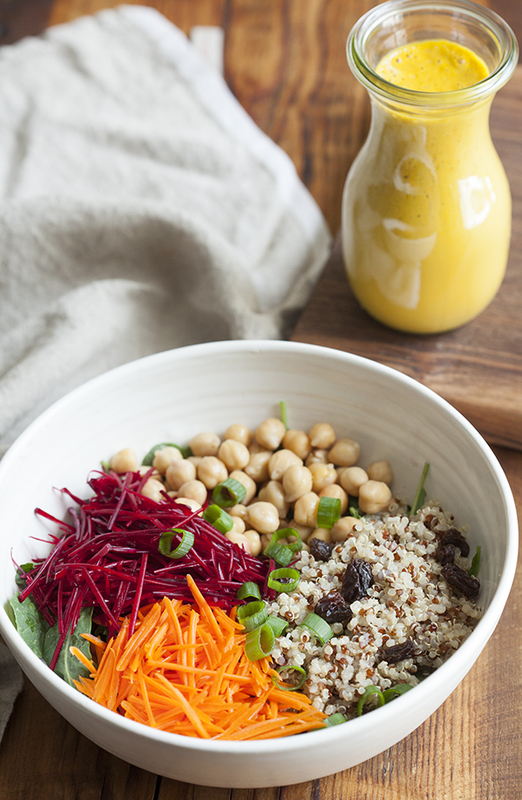 I have a feeling that this bowl is going to be a new staple for me, and I’m glad I made a lot of quinoa and chickpeas this week while I was testing the recipe, because it means that I get to enjoy leftovers all week long. As for the dressing…well, there’s a reason I titled this post the way I did. Just try not to drink this stuff by the spoonful when it’s fresh from the blender. Enjoy the salad and the dressing, separately or together. If you use the dressing on another salad bowl, I’d love to hear about it. And I’ll be back on Thursday with a sweet new giveaway (literally!). Till soon! I can’t seem to get the recipes to print on this site. Oh wow, I love its golden colour! 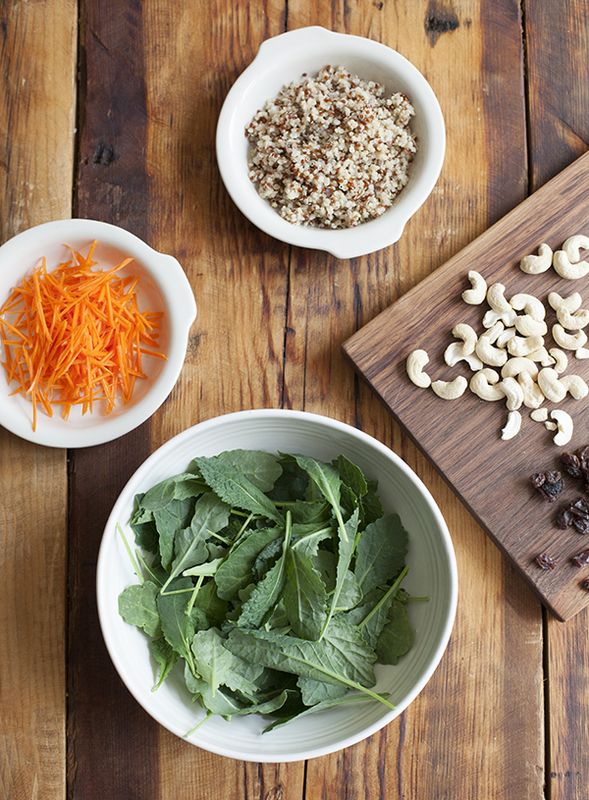 Looking at the ingredients – it sure sounds like my kind of dressing! And great choices for the salad bowl as well! This looks really delicious. I have a question about the carrots and beets in the picture. Do you have a kitchen utensil that cuts them that perfect, or were they julienned by hand? Just curious! Oh, I wish I could julienne so well! I have this box mandoline and grater from Kuhn Rikon. It’s fantastic, and a great investment for veggie prep! This dressing looks finger-lickingly, slurpably delicious. I’m inventing words just to try to express my excitement at this recipe. It screams summer in the best way possible. If not carrot juice, is there another vegetable juice or vegetable that you would recommend? Oh my goodness, Gena! This salad looks devine. & the dressing looks good too – love the colour! Love 141! I went there so many times during my week-long stay in P-Town last fall. 🙂 Thanks for this delicious-looking recipe… will have to try soon! 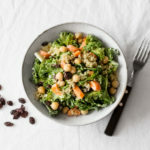 It reminds me of your carrot and tahini dressing, which is one of my favorite and I do it very often, I still prefer it since it use whole carrot and tahini, which is much less expensive than cashews! The carrotini dressing? Yes, it’s super similar (and thanks for reminding me about that one–it’s an oldie but goodie)! to be honest, I still do your «old» recipes, some of which have become classic in my house! I think your blog was more raw oriented a few years ago; your style shows an evolution that is interesting but I feel less appealed by your recent recipes. However, it’s your thoughful comments and inspired writing that have won my admiration overall! Thanks for my thoughts, Catherine! I’m sorry that my newer recipes aren’t appealing to you as much, but I am grateful that you see an interesting evolution and that you cherish CR classics. 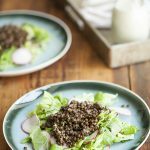 My culinary style has certainly changed a lot, as I move away from raw food influences and towards a host of other influences, and as my own eating style settles into something quite different from what it was when I started blogging. This is something I’ll be writing about more soon, so it’s timely that you brought it up. Delicious! I ate it on my salads for three days straight, then used the rest as a tofu marinade. Added lots of nooch at the end of frying: best tofu ever! Thanks Gena! What do you use to julienne the carrots and beets so nicely? It’s a mandoline from Kuhn Rikon, Kai — link is in another comment above! Bookmarked this page weeks ago! Such a sweet mention of 141 and of P-Town and it was fun crossing paths with you again 🙂 Now there is a new “Autumn Nest” salad with apple ginger dressing! I just started looking for ‘homemade’ vegan creamy salad dressings; this looks delicious! My husband and I visit 141 Market on Bradford Street every fall when we visit P-Town. We get most of our meals there (to eat at the hotel); their vegan desserts are fantastic!